Friends of the late Jerome finucane whom gathered at Irish Wheelchair Association's Resource Centre which was also Jerome's place of work, they gathered to present to his wife Kathleen with a specially commisioned piece hand made by Mr. Frank Chandler, Golf Links Rd., this was to mark Jerome's 40 years dedication to the Association. 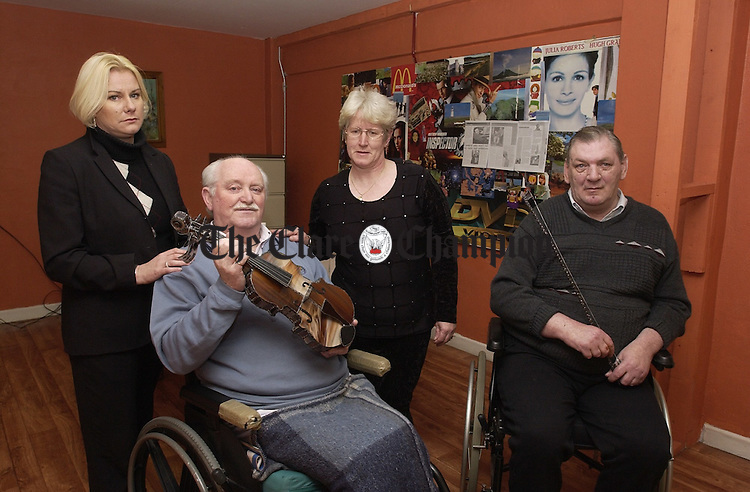 In the photograph, from left to right were, Catherine Earley, C.D.O., Frank Harrigan, friend, Kathleen Finucane wife of Jerome and Liam White, also a friend. Missing from the photograph is Marrita Nightingale, Supervisor. ..